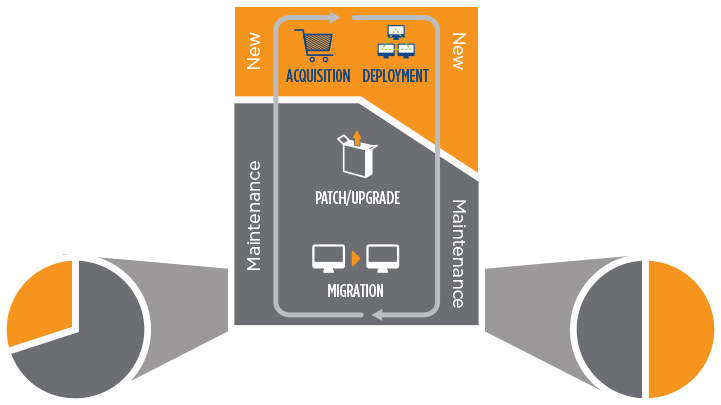 DH2i’s Vhost technology gives you InstanceMobility to dramatically simplify your Linux and Windows IT modernization. DxEnterprise monitors applications, containers and their host nodes and self-heals for both health and performance to meet business SLAs. If an application fails, the software automatically stops the application and restarts it on another host—intelligently determining the best execution venue for the workload. Our Vhost management also includes workflow insertion points and policies for conditional logic coordination and event handling. You can set load balancing and resource requirements for each application instance, and prioritize workloads to meet SLA requirements. The key to solving the patch/update headache is InstanceMobility, which lets you rehost applications and Docker containers with a simple stop-restart. With DxEnterprise (DxE), you can keep managed Vhost applications running on any server you choose. This allows you to patch non-active nodes for any given Vhost application on your own schedule, then simply rehost the instance to the updated node. In most cases, managed applications never have to wait for a server to reboot, so applying a patch is minimally intrusive to any running application. Risk is minimized since the current active node is untouched—if necessary, you have immediate failback to the known-good host. Planned downtime is now the speed of an application stop and restart. Finally, modernization work can be done during the business day, dramatically reducing after-hours maintenance. InstanceMobility and self-healing provide both high availability (HA) and disaster recovery (DR), with application rehosting that’s as simple as a stop and restart to your remote location. Built-in multi-subnet stretch DR can be gated by storage presentation or fully automated, based on your requirements. DxE gives you a single, intuitive platform for both production and DR environments, with drag-and-drop orchestration for all managed nodes and applications. Our Vhost technology decouples applications from the underlying infrastructure, so we support any infrastructure mix. No other approach allows you to independently isolate and test OS version, application patch level and infrastructure. In typical approaches – either virtual or bare-metal – the infrastructure, OS and applications are locked together. With DxE, the Vhost abstracts the application from the underlying infrastructure, so you can quickly rehost applications for faster problem isolation, determination and repair, with near-zero downtime. With DH2i’s logical encapsulation technology, modernization of the application, OS or infrastructure has never been simpler. Using DxE’s intuitive drag-and-drop management console, CLI or PowerShell, you can add new primary or failover nodes to any cluster workload. Simply install desired application templates to the new host and add this node to the desired Vhosts as either a primary or failover target. Remove the node to be retired from the Vhost quorum and you’re done. No data migration needed. Now you can leverage tech refresh for license savings and continued consolidation. Management is intuitive and flexible, using DxAdmin, our GUI, DxMobi, our mobile app for Android or iOS smartphones or Windows PowerShell. DxE dramatically simplifies IT modernization. Instead of spending 70% of your IT time, staff and budget on maintenance activities, we let you recapture those resources to apply to more strategic activities.